Not sure if you can add coconut to your baby cookbook? Read on to find everything you need about giving your babies coconut! 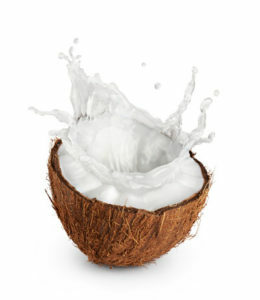 We’ve been seeing many superfood shooting to stardom now and then, none so deserving as the humble coconut. Coconut is an excellent source of fibre, saturated fat and potassium. It is gluten free, cholesterol free and has low sodium. 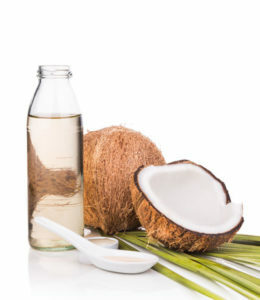 Coconut also has large amounts of Lauric Acid, a type of fat that protects and strengthens the immune system. This fat gives coconut antibacterial, antiviral and anti-parasitic properties that keeps your baby hale and healthy. Mother’s breast milk contains Lauric acid too, from 2 to 20%, varying based on diet. 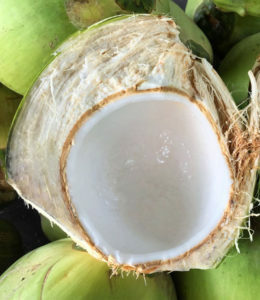 Besides the meat, coconut water is another delicacy bursting with vitamins and minerals. It contains monolaurin, which helps babies fight off infections like cold and flu, and excellently rehydrates babies during sickness. Virgin coconut oil is another gift from coconut. Coconut oil comprises of medium chain fatty acids and contains 50% lauric acid. It abounds in Vitamin E lipids that are potent anti-oxidants which maintain healthy cell functions and structure. Is coconut milk a breast milk/ formula substitute? Nope. If your little one seems to be lactose intolerant, or if you are unable to breastfeed your infant, coconut milk is not the right wholesome substitute. You should consult your paediatrician for the right formula for your baby to thrive on. If you have begun to encourage your little precious to try new flavours and textures, you can add a serving of coconut as a part of his/her balanced diet. You could also make a fresh batch of coconut milk for your baby along with other equally nutritious choices like almond milk, soymilk or hemp milk. Always follow the three-day rule when testing new food with your baby. For babies above six months, fresh coconut water is a fabulous nutritious drink. Strain the liquid to remove floating particles and feed your baby fresh coconut water along with his/her balanced diet. Read this space till the end for some baby-friendly coconut recipes. 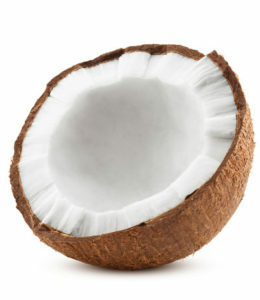 If your baby is enjoying solids, fresh tender coconut is a healthy meal/snack for your little one. Choose gelatinous custard like baby coconuts over the firm fibrous ones for easy digestion. You can also add a spoon of virgin coconut oil to purees or make unsweetened milkshakes with coconut milk for a very filling meal. If you, unfortunately, do not have access to fresh coconuts, you’d have to resort to using canned coconut milk for your little one. Coconut milk is very rich in fat and generally in canned varieties, the fat content skyrockets. On average, a cup of canned coconut milk has around 57 grams of fat, which is like 255 % of your daily fat allowance! If you’ve been feeding your little one fresh full fat cow’s milk, a cup of coconut milk is 10 times fat rich than the whole fat milk. The good news is all this fat is ‘good fat’, but it is wise to keep an eye on feeding your baby canned coconut milk. You can also see a ton of commercial brands selling coconut milk beverages. These are diluted and don’t contain as much fat, but are loaded with added sweeteners and thickeners like carrageenan or guar gum (digestive disruptor), which is not the best choice for babies. Besides, most commercial coconut milk is packed in cans, which increases your risk of exposure to bisphenol – A (BPA). BPA has a habit of leaching into foods rich in salt, acid or fat unless packed with a special lining. Anything is good in moderation. Coconut milk is very fat and calorie-rich food, so substituting it for regular formula or mother’s milk (3 or more servings a day) will cause unwanted rapid weight gain. You can feed your baby a bottle of coconut milk as a meal, but don’t make it regular. Circulate between almond milk, hemp milk and soymilk for a balanced intake. Another risk – coconut milk has very low calcium content. Without other varieties of milk, your baby will miss out on essential calcium. Pick a mature deep brown coconut. Crack its shell, pop out the meat, chop the flesh into small pieces and blend them well. You can add half a cup of water if needed. When you get a smooth puree, filter it into a jar with cheesecloth. Wrap the cloth and squeeze it well to get all the milk out. Leave the jar refrigerated and undisturbed for 24 hours. A layer of curd will form on top, while oil will settle into the bottom. Use a spoon to carefully scrape away the curd and store your homemade virgin coconut oil in a cool dry place. You can use this pure oil to massage your little one and to add a healthy dose of good fat in your baby’s diet. All these recipes are well appropriate for babies older than 6 to 8 months. Coconut adds a unique subtle flavour to purees. You can puree carrots, sweet potatoes, bananas, pumpkin or butternut squash with coconut for mild and delicious baby food. You can add thick or diluted coconut milk to make refreshing smoothies for your son/daughter. You can use avocado, blueberries, bananas, oatmeal, yoghurt and flax seeds to a smoothie with coconut. Pineapple and coconut go well together too! You can use coconut milk or coconut water instead of normal water to cook rice for your baby. Coconut rice is very aromatic and mildly sweet, perfect for little ones. Add a few pieces of coconut to a few spoons of overnight soaked rice, wheat, ragi and almonds. Blend everything and filter, and stir over a low flame to make delicious porridge. You can prepare this thick or diluted for your baby and add either palm candy or salt as needed. Boil chopped veggies in coconut milk with salt and some spices of your choice to make creamy veggies. You can mash them, puree them or serve them with rice. You can also cook fish in coconut milk, (Fish Moilee – a recipe from Kerala). When your baby is over 18 months and can chew well, you can add a generous dash of grated coconut for a delicious crunchy texture. Grated coconut can make boiled veggies, breakfast cereals, sundals, payasams even yummier! You can simply mix grated coconut, fresh yoghurt and some sugar or palm jaggery for an instant dip that goes well with Kuzhi paniyaram/Paddu/Gunta Ponganalu. We hope we’ve cracked the coconut mystery shell wide open for you! Share your favourite coconut recipes with us here!